This miniature beauty from the Blue Mountains of Jamaica was described by Rudolph Schlechter although it had previously appeared as Laelia and Epidendrum. Ideal for the small greenhouse in cool conditions, it is space-saving and colourful. The plant is compact with single, leathery leaves which have a reddish tinge in bright light. The flowers are a stunning scarlet-orange and up to 5 cm. wide and with a purple anther cap. It can be grown in pots or mounted on twigs as it tends to grow in nature. Now available mounted for £16 + £5 postage. Cadetia chionantha is a charming miniature, epiphytic or lithophytic orchid found up to 3000 metres in Papua New Guinea. It was first described by Rudolph Schlechter as Dendrobium chionanthum and, according to Andre Schuitemen in ‘A Guide to Dendrobium of New Guinea,’ this is now the correct name. 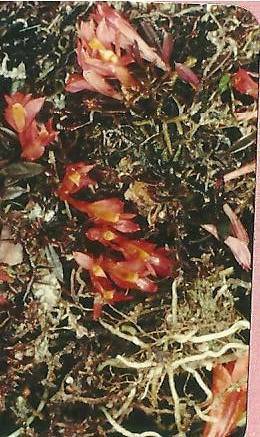 The pseudobulbs and leaves measure together about 5 cm. 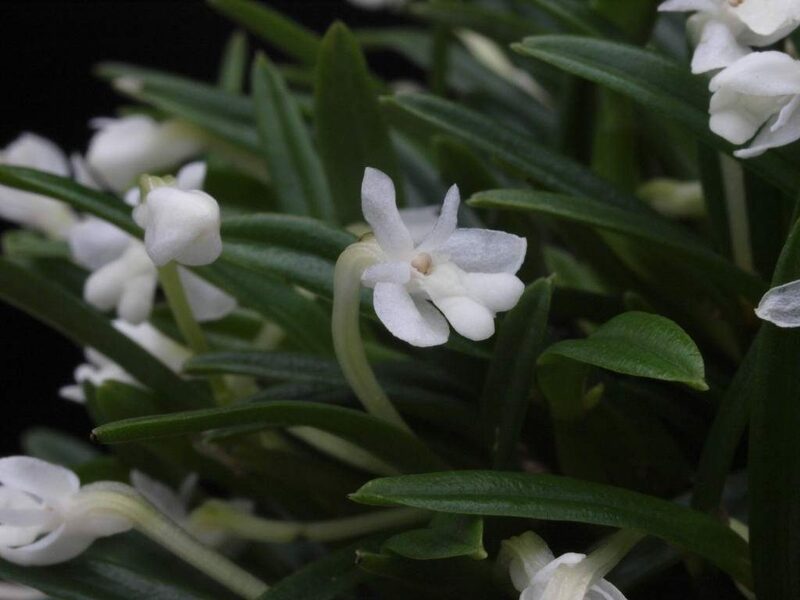 and the plant forms a vivid green clump decorated with crystalline-white flowers which appear all through the year with a boost in spring. It grows best in fine bark compost in cool conditions with high humidity and some shade and should never be allowed to dry out. It does not take kindly to splitting or repotting and then it needs to be handled with care. It is a constant delight to have in any collection.